Our generously sized tea kettles kindly hum when water is ready, not the shrill screech of an average teakettle. The easy-clean stainless steel body helps keep water hot. Ideal any time you need a LOT hot water. Holds well over a gallon! It's great for big gatherings, parties or to keep on the stove for humidity. Very low cost 201 stainless steel, which is very durable, but may get rust colored tarnish in spots, as noted in our reviews. Or select our new, exclusive 304 stainless steel. It's thicker material, formed to more exacting specifications. The higher nickel content of 304 stainless steel means it will keep its high shine finish indefinitely (but at higher cost). Note: Not for induction ranges. I love the tea kettle, but it does not whistle, as the item description says it does. I may plan to return it, as it is too easy to forget about a tea kettle that doesn't whistle, and run the danger of it running dry. I see other reviews about the same thing. If it doesn't whistle, it might be good to change the description of the item and let customers know that it doesn't make any sound at all when the water boils. Lehman's says: We are sorry this happened and are looking into the issue! Please give us a call so we can make it right: 800-438-5346. Received this kettle today. It does not whistle. Lehman's says: Thanks for taking the time to let us know! We appreciate your feedback and are checking into this. Purchased two for my kids...Love the size, but both kettles are showing rust around the inside seams. The kettle works well enough. My problem is with the whistle. The sound mechanism consists of two harmonic reeds in the lid, under the knob. Some reviewers apparently get the sound consistently, and most of them like it. Others report that it works only sporadically (that is my experience), and still others that it does not work at all. As far as I can tell, the problem results from too much of the steam escaping through the spout and around the perimeter of the lid. Sometimes I can get it to sound by pressing down on the lid a bit while holding the cap on the spout down. I have tried adding some 1 stainless steel fender washers directly under the knob to add more weight, but this does not seem to help. Does anyone, I wonder, have a suggestion about how to get the reeds to sound consistently? Wow this is perfect. Using it at church. It is large, easy to clean easy and I know it will last! I love this kettle. We have well water which we boil and then put through a Brita filter for drinking. I was constantly refilling our regular teapot, plus our water is very hard and the mineral deposits ruined the pot. With this 1-1/2 gallon kettle I boil up a pot every day or two. I wipe off the outside and it doesn't waterspot. Plus, the hard water deposits inside scrub off easily with a Dobie pad. It is easy to fill, I can lift it easily, and the whistle (in the lid) is very pleasant. This tea kettle is a real looker but not up to Lehman's well known quality. I was very disappointed in the shoddy and flimsy workmanship and promptly returned this item. The 2 stars I give this item are for design and size both of which are awesome. The kettle is absolutely lovely in appearance upon closer inspection it feels more like tin than stainless steel. Then flapper over the spout is poorly fitted, misaligned and very flimsy. I didn't even try to realign it for fear of breaking it. The weld where the spout meets the body is very poor quality. The distinctive two-tone whistle as described in the item description in totally non-existent. I let it hard roll boil for at least 20 to 30 minutes and not even a soft hiss emitted from this pot. That was the absolute deal breaker for me. I definitely need a whistle and will take the shrill screech of an average teakettle over no sound at all. I will continue my search for a quality, large 4 qt. tea kettle. I somebody would make a quality kettle using this design I would definitely purchase it. I was terribly disappointed. This is an extremely light weight steel. I didn't feel it would hold up - especially because of the larger sizes. I returned without using. I love my new tea kettle. It's LARGE! It's cute, the handle swings out of the way for filling/cleaning. I'm using it for a humidifier on my wood stove, so I have to leave the lid ajar to keep it from whistling. Be aware the whistler is in the lid! I have looked high and low for a stainless tea kettle made in the USA - no luck. This is made in China. It is a nice large pot. The stainless quality is not great - it is rusting in places in less than 6 months of use. I expected better for the price. In addition, the kettle never whistled - it isn't just soft, there is no whistle at all. I did try to fix the lid to have it whistle. Customer service did offer to replace, but I have not decided if I want the same. To be fair, I have used it for over 6 months and did not take action soon enough. 2 gallon kettle had a small but noticeable dent on the bottom curve. The whistle reeds were blocked by a cross piece of metal I snipped that out so all 3 reeds would sound when water boiling. Pretty neat train kinda sound and I fixed a copper fish bell to the spout cover with a stretched out spring set in stove gasket cement. This looks cute when spout moves and also serves as a counter weight to hold the spout lid open while pouring. Also keeps spout lid on securely so steam goes through whistle and I fixed a little aluminum foil around the back of the spout lid to prevent steam from escaping out the back I enjoyed tinkering with it It's very shiny too. Boils up good. Now on its third year, my whistling kettle gets me ready for tea or anything to do with boiling hot water. It does not shriek - it starts a low hum that gets louder if ignored. The stainless steel is excellent on any type of stove, gas, electric, induction. I use it so much with satisfaction I just bought one for my daughter-in-law for Christmas after she went thru four other types in only a couple of years.You have 3 sizes to choose from. I have the biggest. My daughter-in-law chose the middle. The smallest might be quickest. You choose - you'll be blessed. This baby will really hold some water. Well made and you can't ignore the tone when it boils hard. Not a kettle for wimpy wrists. I bought the one gallon tea kettle in march of this year. It is now 10-13 and today I was horrified to notice a lot of black yucky corrosion on the top of the tea kettle and the lid part that fits into the top of the tea kettle. Not a little, a lot! Lehman's are sending me a new one and I give them 5 stars for customer service. I probably should try to find a better quality one somewhere and will keep looking. However, this teakettle is so cute! I just love how when it is boiling hard it sounds like the chugga chugga on a train that's moving and then comes the toot toot!! :] Whoever came up with this kettle had their creative juices flowing and I would like to shake their hand for how many times the cute toot on this kettle has made me smile. However it is an insult to the creativity of who ever designed this for it to be made with such sub-standard poor quality materials. I would be happy to pay 4 or 5 times as much for something that I knew was high quality stainless steal of the type that used to be common in products in America. I am on my second kettle. Lehman's has great customer service. No one issue getting my problem corrected for a return. I am giving a review on the product, not Lehman's. The problem with this kettle is it is not stainless steel. It is a chrome plated kettle. This kettle gets daily use, around 5 to 6 times a day. In less then 3 months, the whistle stopped working. I opened the parts and found rusted parts on the whistle. The lid loses the chrome from friction, and exposes the metal and this is where the rust starts. If you are looking for a high use kettle, this one unfortunately wont last. China rarely makes a quality product, you get what you pay for. Nice design, nice stainless, nice weight...nice kettle! I returned the one gallon kettle after boiling water (twice! )and never hearing a peep. The description says the kettle has a pleasing two tone whistle. As far as I could tell, it doesn't have a whistle at all...although the flap on the spout clacks impressively. It's a handsome kettle and certainly boils a lot of water quickly, but how would one know if he weren't standing in the kitchen waiting on it? I was very disappointed. This rating is because Lehman's is the ultimate in customer service! More, I love the employees here! They make good for everything. I also love this now received 2 gallon tea kettle bought in size for humor, and to find something that wouldn't explode out on pouring as explained below. I joking call her TINY and when the train comes thru town tooting its whistle, I say someone bought a tea kettle from Lehman's! I love this company and their wares. It's not their fault there isn't much is made in the USA anymore. They try and do well and buying this tea kettle even in a larger than life size will make you smile and keep laughs flowing. Rating is on the kettle itself because I bought a Joyce Chen on Amazon where when you poured the hot water out it would vapor lock and then explode onto your hand if you were holding the cup while pouring...so this kettle not doing that is a 4 star for me! I ordered and paid for 2 gallon was sent 1 gallon and it was so large I didn't realize until I read the box. I used it several times and it appears as though there was glue melting from the base of the lid's black knob, and I noticed the knob itself is cracking and even part of the base of the knob's metal is also cracking across. Yes, this is made in China, but I guess I expected more from Lehman's. At first I was overjoyed with this kettle. I bought the 1 1/2 gallon size and I use it almost every day, from canning to heating water to boil spaghetti. I loved the train whistle sound when water boils... but all that changed after about 4 months. A residue started coming out of the whistle part. A couple months later the whistle stopped completely. It's now obvious that even though it says stainless steel the inside of the whistle is NOT! It has rusted out. I can still use the kettle, but miss the whistle. Cheap made in China! Would rather pay more for USA quality! Really didn't know what to expect but was surprised at how large the 2 gallon kettle is. We have large dinners and needed something so we could serve everyone at the same time. Wow! We can certainly serve everyone and make some iced tea too. I love this teakettle! It is really large even though I got the one gallon and incredibly well built. The whistle is so cool, my kids all love it and so do I. I was also surprised because even though some of the steam got on the handle it stayed cool. I was afraid it would get hot and burn me. I am sold on these and am never going back to any other kettle again. My eldest daughter says she wants one for her hope chest! I must say I was surprised when the tea kettle arrived. I purchased the 1 gallon and it is huge. The photo online is very deceiving, with the 3 side by side. You assume you are getting a small with the one gallon. BUT, we really have appreciated the size in time, that it would be perfect should our power go out and we need to heat extra water for washing dishes (we have a gas stove). I also like the whistle. It took us a while to discover it whistles from the lid, not the spout.It looks good too! I end up having tea with family, just to show off the harmonics. I do yoga and it is a perfect ohm! I just love it! I love the cool train-type whistle. It is soft, but I like that it doesn't shriek like other types of kettles. Nice product! We bought the 1 1/2 gallon size. It's plenty big enough. The larger one would have dwarfed our Vigilant woodstove. Seems to be good quality. Whistle is pleasant sounding, but very soft. I use the 1 1/2 gal. kettle at my off-grid cabin for general water heating. Even on a cold day it will heat an adequate amount of water to wash and rinse a large batch of dishes. It is heavy when full, but the handle allows for two-handed pouring. I bought 2 of these teakettles when I saw them, after all they whistle, are stainless steel and have great capacity, right? Then I put one to work and found that the bottom is not flat so it rocks and rattles as it heats, and the whistle works only occasionally. If I had realized that they were made in China, I would probably have expected this and not made the investment in the first place. I ordered the 1 gallon size tea kettle. It proved to be much larger than my needs, so I used it as a gift to my daughter. She just loves it and has a family of 5 to put it to good use. It was a very nice tea kettle and looked like it would last a long time. We purchased three, one for ourselves and one each for our daughters. We love our one gallon size kettle, and the whistle is great. It is easy to clean and heats really quickly. We have lime in our well water and need to keep the bottom from scaling up, with the large opening on top, makes it easy to clean before the scale can build up. Beautiful, lightweight but sturdy. Works wonderfully on my induction range. The whistle is reliable and somehow produces two simultaneous sounds that harmonize perfectly, a lovely sound. The best kettle I've ever used. This is an updated review for this tea kettle. On February 17, AD 2012, I wrote a review. (Please see below.) The new tea kettle works as it should and there is NO rust. Perhaps the original tea kettle I received was just one of those things. THIS is a tea kettle I can and DO recommend. Also, I would like to thank the good folks a Lehman's for their continuing excellent service. Excuse me, now, the tea kettle is humming! Great size and cleaning couldn't be easier. Love the sound! I can hear this one. But not always and for two reasons. First the flapper over the spout doesn't always reseat so I have to insure that it is seated every time I put it back on the stove. If it is not reseated then too much steam escapes the spout to overcome the resistance of the whistle. Also if the heat isn't set high enough it will boil without whistleing. And last but not least remember to fold down the handle so it doesn't get hot. Great kettle but requires more forethought to use safely than it should. This tea kettle is OUTSTANDING! Very large but that is what I was looking for. Very beautiful and functional. Love the whistle too. Believe me you will not be disappointed. I ordered the 2 gallon size and am thinking about getting the smaller one also. Well made and exactly what I wanted. The one gallon size is perfect for us! I received the 1 gallon tea kettle as a gift. I was so pleased, as, when I originally looked at this site, there were only 5 star reviews here. The size is grand, the overall balance is great. But my tea kettle doesn't whistle either. As a matter of fact, one of my children noticed the tea kettle lid was not assembled as the picture on the box. In addition to that, the inner lid, although dried when not in use, is beginning to rust. I would not have been so enthusiastic in my want of this kettle had I known it was made in China. In fairness to Lehman's, the tea kettle was replaced, gratis. For that, I am grateful. But the tea kettle, which is being reviewed (NOT Lehman's customer service, which is excellent) is a big disappointment. I purchased the 1 1/2 gallon whistling tea kettle to use on my wood cook stove but to my disappointment it does not whistle when ready. I am not sure if the kettle is defective or it just isn't suppose to whistle. I love the large size and will probably keep using it. Lehman's products are of extreme quality. I ordered the 2 gallon tea kettle first and it was amazing! I have used it repeatedly. I loved it so much that I ordered the next size down the 1 1/2 gallon tea kettle and it is also perfect! Thank you Lehman's for such high quality products and great customer service that goes above and beyond! Looking forward to future orders! 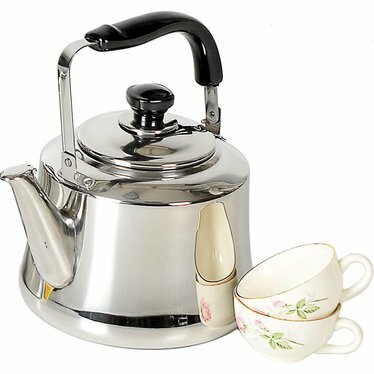 we have been looking for a whistling te kettle that was loud, held alot of water for us tea and coffee addicts, and was well made. I ordered the gallon size. When it came, my husband went WOW! That's SOME tea kettle! After the first cuppa, and a satisfied aaahhhhh, I can highly recommend this kettle. It is so hard to find a decent, cleanable kettle with this kind of liquid volume, thanks Lehman's! Right now I give it a five rating...time will tell if we are correct about the quality of it's workmanship. OH MY! The large kettle is absurd! It's HUGE! And AMAZING! Alas, it's too huge, and amazing for us and I'm going to have to exchange it for a smaller one. But the quality of this kettle is outstanding. Can't wait to get another! Got the gallon size so could make 4 LARGE cups of tea at a time. Works wonderfully. The handle is really well done to enable using both hands to pour when full. I love this tea kettle. Thanks again Leham's for another great product. And your packaging is also top notch! This kettle is the bomb! Thanks for a great teakettle. I ordered the 2 gal. one and I am so pleased. The quality of workmanship is excellent, plus the price was nice too. It looks wonderful on my Sweetheart cookstove. Thanks for a great product. this kettle makes my life so much easier when i made kombucha! i dont use microwaves or my stove very much (we eat a mostly raw diet) so i was in the market for a way to boil a gallon of water and this is perfect! very happy with the product! also it is easy to clean because the opening is so large. I am writing a review on the large spout kettle, item 1079040. This kettle is a dream! It holds a very large quantity of water (7.4 quarts) which is wonderfully convenient when you need to have a lot of hot water on hand. It's light, yet heavy duty and quite durable. I appreciate the fact that the handle can be lowered, which makes it very easy to fill the kettle. One thing I found to be especially pleasing is that the kettle is very easy to handle when pouring, even when filled to capacity. If you're looking for a good quality, attractive, serviceable kettle, I highly recommend this one! I just received my large spout kettle. It is well-made, sturdy, and all I hoped it would be. The handle is nice in that it folds down. Also, the lid is plenty big so that when the time comes to clean the inside, I'll have no trouble getting my hand inside. Thanks Lehman's for such a great product! Really like this kettle--very handy during a power outtage or when you need extra hot water when canning. Nice design. I bought this a couple of weeks ago. I love it. It is well worth the price and the quality seems to be great. I would definately recommend this product to larger families. My husband wanted a BIG tea kettle and this far-exceeded both our expectations. Its wonderful quality and value. THANKS Lehmans! I am very pleased with this kettle. The size is hard to find and I also like that the handle folds down. Kettles of this size are very hard to find. This is a great product that holds up well over time.